(Phys.org) —The monkey roadmap out of Africa has a new timetable and route, thanks to a tiny tooth plucked from the Arabian desert. Yale anthropologist Andrew Hill and a group of international colleagues found the fossil, a monkey molar 6.5 to 8 million years old, in the sand on Abu Dhabi's Shuwaihat Island, in the United Arab Emirates. They determined it belonged to the earliest known guenon, a group of monkeys previously known only on the African continent. "There are only two fossil monkeys in the whole of Arabia and we have found both of them," Hill said. "This is very important geographically, being at the junction of the great Old World biogeographical zones." 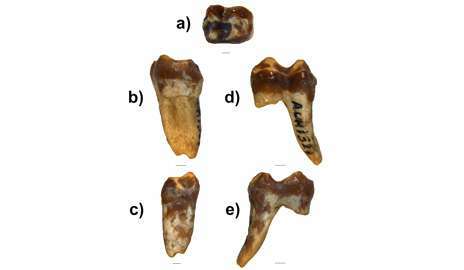 Scientists from Yale, Hunter College-CUNY, the Museum fur Naturkunde-Berlin and the Abu Dhabi Tourism and Culture Authority announced the monkey tooth find in the current issue of Proceedings of the National Academy of Sciences. The discovery suggests that Old World monkeys traveled from Africa to Eurasia a million years earlier than previously thought. Prior theories speculated that some monkeys made their way from Africa to Eurasia via the Straits of Gibraltar or the Mediterranean Basin six million years ago. That would have been during the Messinian Crisis, when the Mediterranean Sea dried up. "Now we know that, in fact, the route through Arabia was available a million years before the Messinian Crisis," said Chris Gilbert, a former Yale postdoc who is an assistant professor at Hunter College. He was the lead author on the study. Gilbert described the fossil molar as tiny. "First we needed to determine whether this was an adult or a baby tooth," he said. "Once we determined it was an adult, we figured it was a guenon. That was totally unexpected." Guenons are tree-dwelling monkeys known for their bold markings. The group includes vervets, Diana monkeys, De Brazza's monkeys and red-tailed monkeys. The guenon found in Abu Dhabi is the only one known, fossil or living, outside the African continent. It also almost doubles the time depth of guenons known from the fossil record Previously the oldest, from Kenya, was dated to about 4 million years. It was Faysal Bibi of Museum fur Naturkunde, also formerly at Yale, who made the discovery in 2009. "He picked up the tooth and said, 'Look at this,'" Hill recalled. "I said, 'You're right. It's a monkey.'" Hill is the J. Clayton Stephenson Professor of Anthropology and curator and head of the division of anthropology at the Peabody Museum of Natural History. He has conducted research in Abu Dhabi since 1984. Hill and Bibi are co-directors of the current project, which is a joint expedition of the Abu Dhabi Tourism and Culture Authority and the Yale Peabody Museum of Natural History. Hill said the region has yielded a trove of fossils, including the remains of crocodiles, ostriches, antelopes, horses, elephants, and rodents. "Faysal found a very nice giraffe," Hill said. "There were just fossils lying about all over the place when I first visited, because no paleontologist had been there. You'd look around and say, 'Isn't that an elephant's scapula?'"